Christians used to keep 150 pebbles to signify each time they prayed the 150 Psalms of David prayer. They would take the pebble out of one bag and place the pebble into another bag after each prayer. Today it's lighter and easier to keep accountable of each prayer. It is important to note Pope John Paul II gave great homage to Mary when he dedicated a Year of the Rosary and added five Luminous Mysteries. The Blessed Mother gave the children of Fatima a rosary and asked the children to pray to her son, Jesus Christ. In keeping with the requests and the prayerful thought, the rosary rings were created. It allows one to travel unencumbered to their favorite prayer and meditation place, yet still have a system of documenting each prayer. Each rosary has 10 beads and each bead represents a decade. 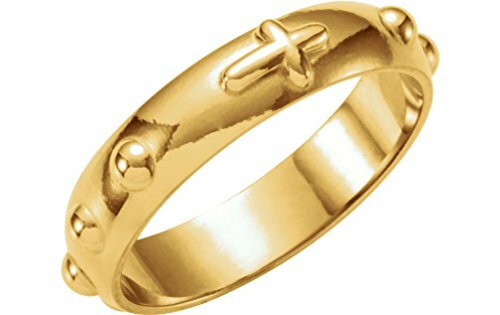 It's fitting this is crafted of gold; it's said spiritual energy and power are activated and awakened by wearing or praying with gold. Gold represents the spiritual treasure gained by transforming the spirit; it also represents love in the Bible. This is earth friendly as it is made with the Refined Karats system certified by Scientific Certification Systems' (SCS) strict requirements. Proudly made in America with a green process of ethically, environmentally and socially responsible production processes of water, waste and energy management; this is from 100 percent recycled Karats. Thank You for Your Consideration, We Appreciate You. Faith is Always Fashionable... Never Trendy.